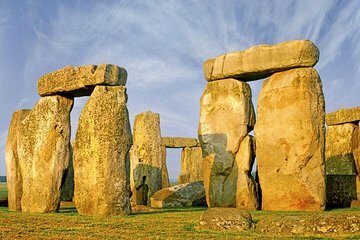 Esta excursão de 12 horas das três das principais atrações da Inglaterra dá a você a oportunidade de ver Stonehenge, Bath e Windsor em apenas um dia. Ideal para quem tem pouco tempo, esta excursão permite que você viaje com facilidade e eficiência de Londres em um ônibus moderno. Explore a majestosa cidade de Windsor, lar da mais antiga habitada castelo do mundo; desfrute de uma excursão guiada de Bath e suas atrações; e mergulhe na de 6.000 anos de história de Stonehenge. Este itinerário amigável para iniciantes inclui passeios abrangentes para caminhadas e / ou guia de áudio em todos os pontos turísticos. Depois de embarcar no ônibus executivo no King's Cross em Londres, relaxe durante a viagem de 1 hora ao castelo de Windsor. Lar de Sua Majestade, a residência oficial da Rainha, o Castelo de Windsor, a charmosa cidade faz com que o pitoresco passeio turístico. Em uma excursão a pé guiada, você absorva Windsor o encanto histórico e, em seguida, você terá tempo livre para explorar por conta própria. Opte entre o Castelo de Windsor por sua conta. De volta ao ônibus, você viajará para a bela cidade georgiana de Bath e mergulhe nas suas história romana em uma excursão de 1 horas, durante a qual você entrará os Banhos Romanos. Depois disso, aproveite o tempo livre antes de reencontrar com o seu grupo e embarcar no ônibus. Na chegada em Stonehenge, um círculo de pedras que tem mistificado especialistas milênios - embarque em uma excursão guiada com guia de áudio (fones de ouvido limitada disponível), o que revela o patrimônio da humanidade pela UNESCO, local de interesse da história. Visite o centro de exposições durante o tempo livre e, em seguida, relaxe durante a viagem de volta à Estação Hammersmith, onde a excursão termina. Observe que o almoço não está incluído, mas está disponível para comprar durante a cada parada. I booked this tour before I left the US for my vacation first stop London. This is only one of the tours I booked with Viator and I am very worried that all maybe the same. Firstly let me start by saying I was on time however we did have to wait for some of the people who were late and I found out when I got there that this was a student tour and I paid way more then the other people on the bus and I did mentioned this to the guide. One of the things about the tours is the tour guide did not walk around with us and of course it may have been that she wanted us to do what we feel like and go where we want without having to follow a set path. It was one of the hottest day of the year in London and the A/C was not on high in the bus. The bus had a very very bad smell that was coming from the bathroom on the bus and I was sitting at the front of the bus so I can only imagine what it was like at the back of the bus. Please keep in mind that the tour had just started. I told our guide that can she please check to see if the bathroom door was open she did and it was close. She gave me some air fresher to use however it did not help.The tour was very rush and we did not get to spend any length of time at any of the places that we visited. Three of the people got lost in Bath because they did not speak very good English and was late for the pick up time they where told by the guide on the phone that they had to find their way back to London by themselves I have no idea if they did. On our way back from Stonehenge I told the guide that I think that I will faint on the bus because of the heat and the smell she then checked the vents and open it so the bus could get cool at this point the smell was so bad that the people at the back could not take it so they were given the air fresher to use. The person next to me suggested that I try to breath though my mouth as he was doing. We were pick up at Kings Cross and we all thought we were going to be dropped off at the pick up stop but we found out on our way back that we were going to be drop of at another station because of Sunday traffic. We were surprised and some of the people looked on in horror as we walk into the train station and found it was closed. I was very lucky that the person that was sitting next to me on the bus was friendly and helpful as he shown me how and where to find the bus to take me to my hotel he have been living in London for the past 3 months and knew his way around for me I had only been in London for 24 hours This is the worst tour I have ever been on and I will not recommend using Viator as a platform for booking any tours in London as you don't get what you paid for saying it was awful is a mild word I have also come to realize that not all the review is real and honest this one is. When I go on the other tours that I have already booked and paid for though Viator I will write reviews about those. In closing I am hoping that people who were on the tour will be good and write how they felt about this tour and not only vent on the bus as they did. This was an incredible day! Our tour guide, Gavin, was a gem and he really knew his stuff. He was as entertaining as he was knowledgable I highly recommend this tour!